To be honest, at the time I really didn’t know much about Ellen Hutchins, other than she was Ireland’s first woman botanist and died two hundred years ago. Reading about her life, I soon realised that she was really quite extraordinary. As well as being blessed with an uncanny ability to discover new and rare plants, she was also a talented botanical artist. In her short life (she tragically died aged 29), she managed to overcome great hardships and illness, and gain international recognition for her achievements. She had a number of plants named after her, and her work was included in a number of publications. Her paintings of seaweeds which were on display in Bantry House for the festival are simply exquisite. She must have had superb eyesight because the detail is just astonishing. Madeline Hutchins, her great great grandniece, has definitely inherited some of Ellen’s drive and enthusiasm. 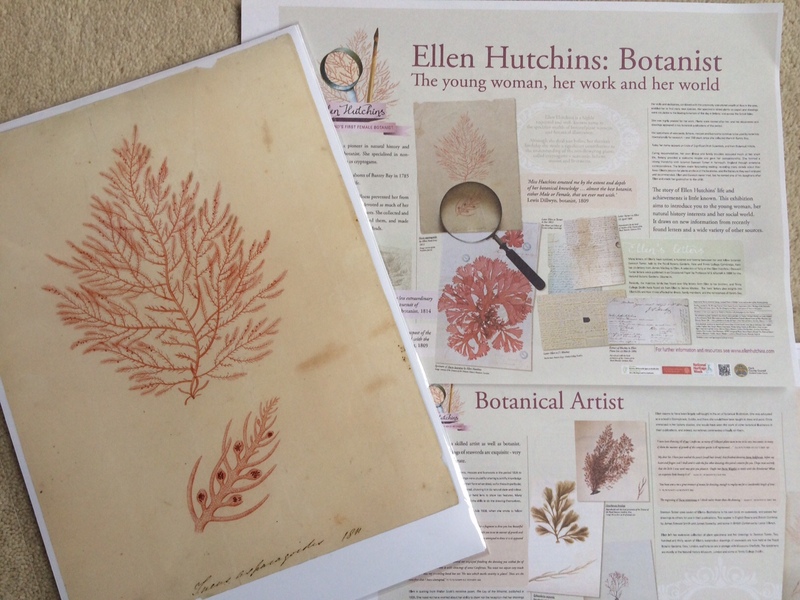 For the past year she has been relentlessly tracking down Ellen’s letters and artwork from museums and herbaria. Together with Clare Heardman (Glengarriff Woods Nature Reserve) and Angela O’Donovan (Bantry Historical Society), they put together a really impressive programme of events for the Ellen Hutchins Festival in Bantry, co.Cork. It was a wonderful opportunity to throw my paints and brushes into the car and head to the beautiful west coast of Ireland. I had to smile because when you get to Cork, there is simply a big sign on the road that just says “To the West” and you just follow that road until you reach the sea! The exhibition was being held in Bantry House, formerly the home of the Earl of Bantry, and still retains a lot of it’s former glory with sweeping vistas over the bay. I was given the honour of opening the exhibition and also asked to give a botanical art demo. As Ellen was best known for her interest in algae, I thought it would be fun to paint some seaweed. 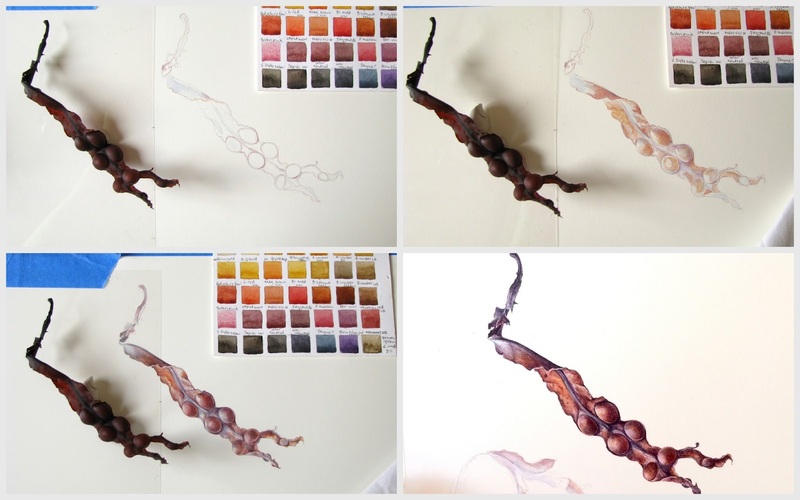 My friend Elaine Mackey had given me some lovely bladderwrack, Fucus vesiculosus, to paint. It’s twisted curling form was fun to do and it was nice to get out the earth colours once more. Bladderwrack study- This is a great subject particularly for the beginner artist as it has some wonderful shapes and doesn't wilt! Begin with loose washes of blues and purple. I used cerulean and cobalt violet for the highlighted areas, and adding mixes of light red, perylene maroon and perylene violet to the washes to build up form. As I pulled out my paints, I couldn’t help but wonder what paints Ellen would have used. We are so spoilt for choice these days with the wonderful range and availability of pigments. Many of the modern pigments are synthetically produced and only came into being in the mid 19th century. Ellen began painting in her teens (around 1800), when a family friend Dr Whitley Stokes concerned about her frail health, felt that an interest in Natural Sciences would restore both her appetite and her spirits. However when I did some research into the pigments that were available at this time, I was quite horrified to read that many of the paints were extremely poisonous, containing highly toxic compounds such as lead, mercury, chrome, arsenic and cyanide. No wonder she often felt so unwell! I’ll be writing more about pigments later as it’s really a fascinating topic! Despite the hardships that she was enduring in her life, (she looked after her mother and her invalid brother who required full time care, and her own ill health), it is obvious that she found great solace in her art and her walks along the shores. 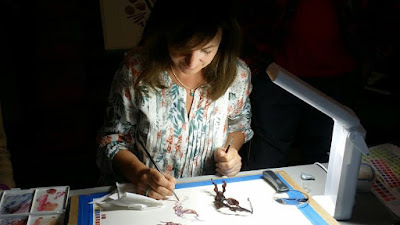 She often includes enlargements on her illustrations, so it's easy to imagine her delight at peering through a microscope, and the satisfaction she must have felt at getting every tiny detail just right. How thrilling it must have been to discover new plants, and to correspond with eminent botanists and scientists of the time about her finds! To have her artwork included in important publications must have been a dream come true, although shyness made her reluctant to have her name included. I walked around the exhibition with my own magnifier, peering closely at the paintings which are for the most part kept at Kew. I would have loved to have seen her sketchbook and read her notes, for she must have kept one, but sadly these have been lost, or perhaps are just waiting to be discovered in an archive somewhere. It was a thoroughly enjoyable evening. I met so many interesting people- botanists, naturalists, historians and art lovers. 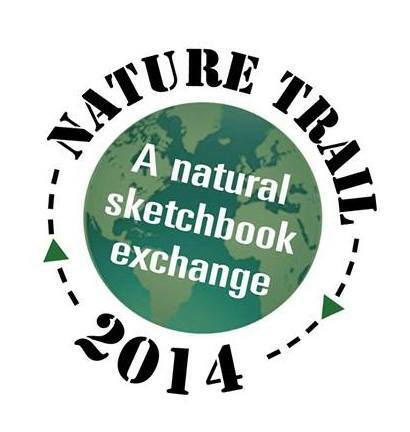 The festival with it’s nature walks, boat trips, botany talks and botanical art was a resounding success. Ellen no longer lies in an unmarked grave but has been given the recognition that she truly deserves. As for Bantry Bay, well, I did manage to leave with my next painting subject! That blue tape comes in handy again! Wonderful, thank you for sharing. I will be reading Ellen Hutchins web site that you so kindly shared with us. It's always good to read about the people who shaped the world as we know it today. I'll be writing more about this later, particularly with reference to the development of watercolor in the 18th century. 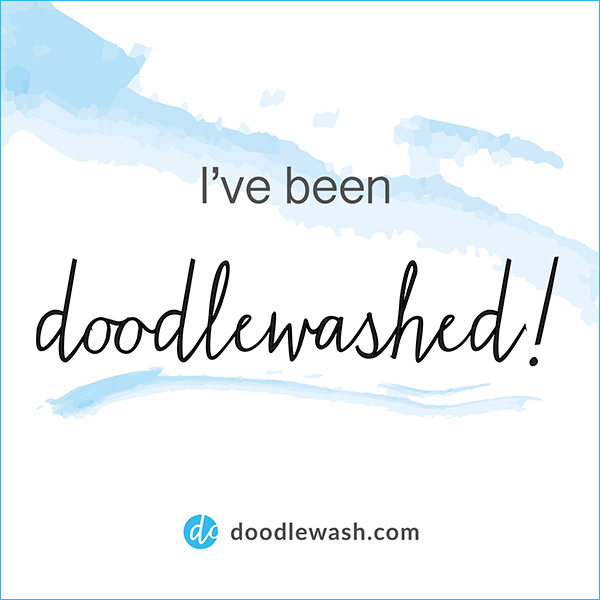 It was so interesting to do the research, but far too much information for a single blog post! Looks like you had an interesting weekend in the lovely Bantry Bay! Your seaweed painting turned out beautifully and looks like it fit in well with the rest of the exhibit. Your demonstrations are opening wonderful doors for you, aren't they!? Thanks. Yes, there are many wonderful things happening for me now. I'm really blessed. Your painting of the bladderwrack has a Matisse flavour to it. I love the feedback so please feel free to comment. Thank you!